Conferencia "Reconstrucción del proceso pictórico del arte rupestre y aspectos de su contenido, análisis e interpretación, desde una perspectiva teórico-metodológica en el estilo Lower Pecos"
Carolyn E. Boyd is the Executive Director and co-founder of a nonprofit corporation, Shumla Archaeological Research and Education Center (www.shumla.org). She serves as Adjunct Professor at Texas State University and as Research Fellow at the Center for Arts and Symbolism of the Ancient Americas in San Marcos, Texas and the Texas Archeological Research Laboratory in Austin. 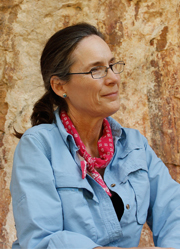 Boyd received her doctorate in archaeology from Texas A&M University based on her analysis of the 4,000 year-old rock art of the Lower Pecos Canyonlands of southwest Texas and northern Mexico. She is the author of Rock Art of the Lower Pecos, published in 2003 by Texas A&M University Press and The White Shaman Mural: An Archaic Codex, which will be available in 2016. She has been published in Antiquity, American Antiquity, Latin American Antiquity, Revista Iberoamericana de Lingüística, and has contributed chapters in several edited volumes. Boyd teaches Field Methods in Rock Art, a three-week field school offered through Texas State University, gives numerous lectures around the country and abroad, serves on graduate committees, and is the Principal Investigator for the Lower Pecos Border Canyonlands Archaeological Project. Conferencia "Reconstrucción del proceso pictórico del arte rupestre y aspectos de su contenido, análisis e interpretación, desde una perspectiva teórico-metodológica en el estilo Lower Pecos".